Aromatics like ginger and garlic add depth to this hearty meal. 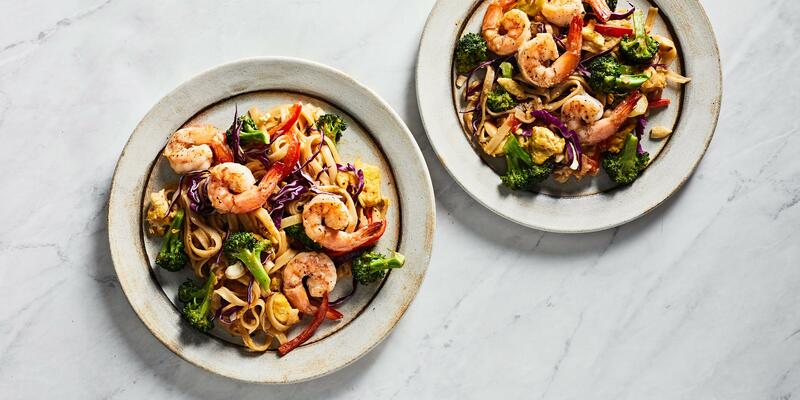 “A small amount of noodles goes a long way when you add vegetables and shrimp,” says New York City–based recipe developer Laura Rege. Egg is also scrambled into this dish, which features broccoli, bell pepper, and a cashew-based take on the traditional gado-gado peanut sauce. Make the sauce: In a blender, combine the cashews, soy sauce, rice vinegar, miso, red pepper flakes, and ¼ cup water and purée until smooth. The sauce should be thin as it will thicken when added to the stir-fry. Cook noodles according to package instructions, then rinse with cold water and drain. Place a cast-iron skillet over high heat with 1 tablespoon olive oil. While the skillet heats up, pat shrimp dry with paper towel and season with salt and pepper. When skillet is hot, add shrimp and cook, tossing a few times, until opaque, about 2 minutes. Transfer to a plate and set aside. Return skillet to high heat and pour in eggs. Allow eggs to set for about 20 seconds, then scramble, leaving the curds large. Transfer to the plate with the shrimp. With the skillet still over high heat, add 1 tablespoon of oil along with the broccoli, bell pepper, onion, garlic, and ginger. Season with salt and pepper and cook until broccoli is tender-crisp and the rest of the vegetables are tender, about 5 minutes. Add the noodles, shrimp, and scrambled egg to the skillet. Pour in the cashew sauce and toss to coat and heat through, about 2 minutes more. 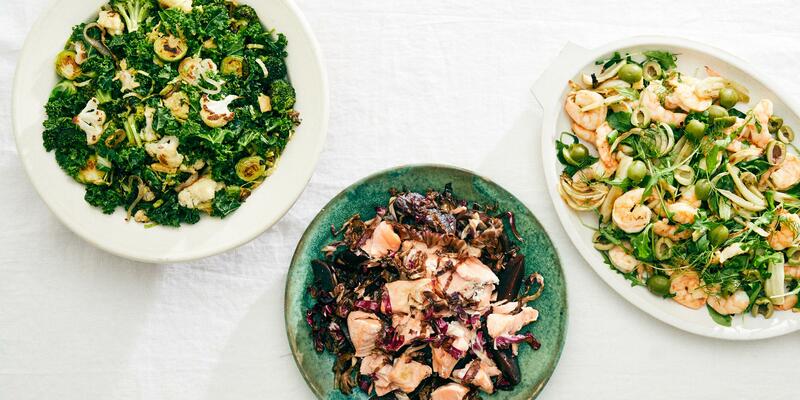 Transfer to a serving plate and garnish with cabbage and chopped cashews. Serve with lime wedges for squeezing over.